The Chicken Patio at Put-in-Bay has been serving chicken dinners for since 1952. 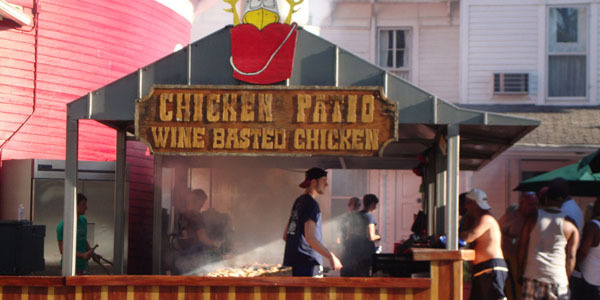 Half chickens are prepared on a 21 foot charcoal grill and basted with their signature wine sauce. Corn on the cob, potato salad and a dinner roll complete this finger licking meal. Cocktails are availalbe from the outside bar of The Roundhouse. If you get a waft of some delicious food while strolling downtown Put-in-Bay, chances are it's The Chicken Patio. Don't forget the sauce!